The idea was born on a honeymoon: John Vitale and Alissa Napoletano-Vitale's 2012 honeymoon in Paris and Tuscany proved to be quite productive. Falling for the crepes in Paris and the handmade pasta and fresh-roasted coffee in Italy, the Cresskill pair decided they wanted to open a restaurant in North Jersey, featuring European dishes. 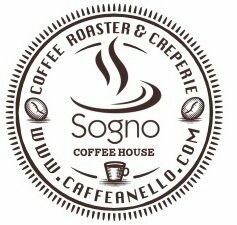 They began by launching Sogno Coffeehouse with Alissa’ parents (Joe & Cheryl Napoletano) in November 2012, which quickly became a popular Westwood neighborhood spot for its sweet and savory crepes and in-house roasted coffee. Then in 2013, they expanded next door to open Caffe Anello, a 20-seat Tuscan-inspired eatery with an open kitchen and daily fresh-made pastas. "Since I was 8 or 9, I've been in the kitchen with my parents and grandparents," said John, chef/owner. "Cooking is a hobby that's become a profession." Alissa, a native of Cresskill, does marketing and social media for the restaurants.